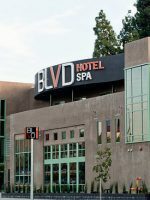 This family-owned establishment, located in North Hollywood, California, is named after the late Beverly Garland, a famous film and TV actress. She is responsible for the hotel’s interior dÃ©cor, which features a retro-modern look, along with lush gardens and palm trees. In recent years, the hotel has received many enhancements, including newly renovated guestrooms, a revamped lobby and lobby bar, and the addition of Beverly Park, an outdoor venue for weddings, reunions and other events. 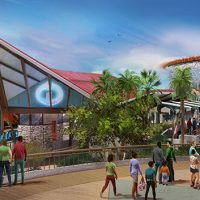 In the near future, the hotel also has plans to add a new restaurant, The Front Yard. 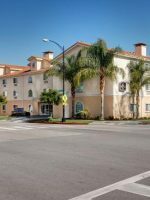 The Garland is a good choice for families due to its location near popular sites, such as Universal Studios Hollywood and the Universal CityWalk; in fact, the hotel provides free trolley service to both attractions. 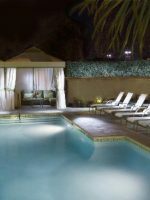 The cost factor is also attractive for families — nightly rates are relatively low for Hollywood, and discounts are regularly offered. Other perks include a pool with dive-in movies, as well as Kids Rooms — special accommodations with bunk beds, plus separate, private spaces for parents. All rooms offer helpful amenities, including mini-fridges, bathtubs and free Wi-Fi. Guestrooms and suites reflect the hotel's legacy and retro feel, and suites are named after members of Beverly Garland's family. 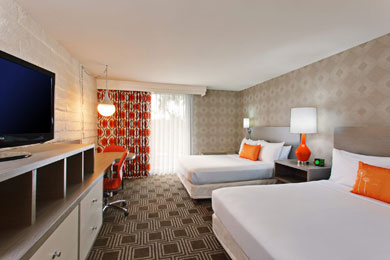 The rooms are brightly painted in orange and white and patterned wallpaper, and are decked out with retro-style furniture. They feature private balconies, complimentary Wi-Fi, DVD players, mini-fridges, flat-screen TVs and coffeemakers. Cribs and rollaway beds are available upon request and there is a $25 nightly fee. Only one rollaway bed is allowed in each room. Due to safety regulations, certain room types cannot accommodate a rollaway bed -- these include Deluxe Rooms (king bed and two queen beds), Kids Rooms and Pool View Rooms. ADA rooms are available. Deluxe Rooms offer sufficient space for families and come with one king bed or two queen beds. Premium Rooms feature a deluxe king bed and offer a pool view. Kids Rooms feature partitioned suites to offer privacy for both parents and children. Parents get a queen bed, while kids get twin bunk beds. Each room has a flat-screen TV and the kids also get their own DVD player. With 1,000 square feet, this suite offers a separate master bedroom with a king-size bed and master bath, a living area, and a wet bar kitchenette with a full-size refrigerator and microwave. This 650-square-foot suite offers a separate bedroom with two queen-sized beds, plus a living area with a sofa bed, sleeping six guests. It also has two bathrooms. This 650-square-foot suite offers a separate bedroom with a king-size bed, a living area with a sofa bed, and two bathrooms. It sleeps four. This suite is exactly the same as the Cathleen Suite, featuring a separate bedroom with a king-size bed, a spacious living area with a sofa bed and two bathrooms -- perfect for a family of four. There is an outdoor heated pool that is 5 feet deep at most. It is not supervised by lifeguards. Pool hours are 5 a.m. to 10 p.m. and it is open daily, year-round. Poolside games, activities and dive-in movies are offered during the summer months. A complimentary walking tour of the neighborhood is offered Tuesdays at 7:30 a.m. Guests can see the original Brady Bunch house and other famous sites. The food in the Courtyard Canteen is inspired by Los Angeles. Pricing starts at $14 for entrees, with offerings such as kale Caesar salad, roasted garlic hummus, kalamata olives, roasted tomatoes, and feta warm pits for $10, as well as fish tacos. It also has a kids' menu with cheeseburgers, chicken fingers, salmon and grilled cheese, and these entrees come with a choice of French fries, fruit or broccoli. Kids might also like veggies with hummus and penne pasta with butter and Parmesan cheese. The kids' menu doubles as a coloring sheet and crayons are provided, as are Wikki Sticks and high chairs. The breakfast buffet is $15 per adult, and $8 per child, or you can get continental breakfast for $11. Breakfast is served from 6 to 10 a.m., and lunch and dinner are served 11 a.m. to 10 p.m. Note: The Courtyard Canteen is a temporary onsite dining option. The Front Yard will be the hotel's main dining option following renovations in the spring of 2015. Hours at The Front Yard will be similar with extended hours on the weekends. The Lobby bar offers drinks and small snacks. Guests can enjoy beverages and bites at the bar or by the pool. Currently, The Bar serves the same food as the Courtyard Canteen. When The Front Yard opens, a modified menu will be offered at The Bar, with exclusive options available. It's open 11 a.m. to 10 p.m.
Complimentary trolley service to and from Universal Studios Hollywood is offered, with drop-off and pick-up at the Universal City Substation. Valet parking will be available post-renovation, and will start at $27 per day. A fitness center is located onsite and offers a variety of exercise equipment. Hours of the fitness center are 5 a.m. to midnight, daily. The fitness center is equipped with several pieces of cardio equipment, weight machines and fresh towels. The hotel offers same-day dry cleaning, as well as onsite laundry facilities for guests to use. The onsite laundromat is open 24 hours daily, and laundry detergent is complimentary. The Garland also has same-day dry cleaning in which guests can schedule a pick-up before 8 a.m. and receive their items after 5 p.m. The Store is located next to the lobby and is where guests can pick up Universal Studios Passes and book tickets to local attractions. Souvenirs and locally made items are also for sale here. The store is open 8 a.m. to 10 p.m. daily. The hotel is open year-round, though renovations continue into spring 2015, when the hotel will host a grand opening event. Services and amenities are not being disrupted. Due to the warm weather, the hotel is busy all year, but summer is busiest, while winter is slowest. The temperature rarely drops below 70 degrees year-round. The Bob Hope Airport in Burbank is located just 15 minutes from the hotel, while Los Angeles International Airport is 30 minutes away. Getting to and from the hotel may take longer due to traffic, which is notorious in Los Angeles. 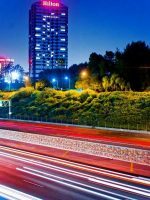 A rental car is good if guests plan on sightseeing throughout Los Angeles, though airport transportation to and from the Garland may be best if guests do not plan on venturing far from the property. The complimentary trolley service provides drop-off/pick-up to and from Universal Studios Hollywood and the Los Angeles Metro line. If the plan is to see other areas of Los Angeles and the surrounding towns, a rental car is key. The trolley leaves every 30 minutes, starting at 9 a.m. The last return trip is at 9:15 p.m.
Parents can check out Ventura Boulevard for shopping and a mix of dining options. Another option is the NoHo Arts District for dining options and the theatre.